Take Up the Quest for Allaire of the Nine Rings! I learned I wrote The Ring of Allaire fast. Not in the “write your own book” notebook. I could tell already that it wouldn’t fit. I liked how it went—I fell in love with my characters. I revised, I got a portable typewriter, I did more drafts, and then I sent my queries out. I started with Ballantine Books, since I’d been reading a lot of them. Nine months later, I got a letter from Lester del Rey—he’d like to see the book. The whole book. 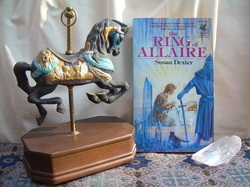 Reasonably, I sat right down and re-wrote The Ring of Allaire, from one end to the other. After all, someone other than me was going to read it now! And Ballantine Del Rey Books published it in 1981, so lots of people got to read it. I wrote more books in my invented world of Calandra. And the world turned. Time marched on. The books went out of print, and I got my rights reverted. I learned to use computers. I learned to take digital photos. Missing Tristan, I re-wrote his trilogy from one end to the other. When traditional publishing was underwhelmed by the notion of a rewritten trilogy, I brought the books out as e-books. When I decided to bring them out in physical form via CreateSpace, I was able to do something I’d longed to do—I painted my own covers. And then Teddi Black turned those paintings into the covers I had always dreamed of!